It's a one-way street. French drivers here get away with it. Typical soft UK attitudes. I thought the EU was to even everything out....nope.! I'm now actively avoiding France. The sentiment is fine, but the fine itself escalates quickly and 45E is a small price to pay. I too hate the whole system. As far as I know the only cooperation the French, and other EU countries get is that the DVLA provides them with details of the registered owner. No enforcement takes place on this side of the border. UK authorities have exactly the same rights, and if they don’t excercise the right it is no fault of the French. If it was me I would just pay the fine. I am annoyed by the proliferation of cameras in France, but I have seen as many in Italy - there is one in every village, and they are rear-facing. Beware, as, if you exceed the limit by something like 40% the penalties become draconian, they can confiscate your bike. Forty percent sounds like a large margin, but overtake a car safely in a 50km/h zone and it is all too easy to accelerate to 70km/h. As above, don't believe the anti EU fairy stories, look where that's gotten us. They can't prosecute you this side of the channel but could just sell the civil debt onto a collection agency here. I'm going to begrudgingly pay the 45e for the following reasons. If I don't, the fine goes up to 68e then 180e. 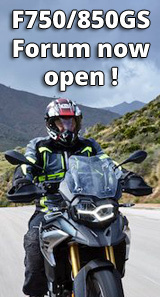 I go to, or pass through France regularly to get to some of the best riding roads in Europe. I like French food and I like France despite the French laws and cameras. As said, France is now crawling with speed cameras and the villages are marred with speed bumps. However, there are valid reasons for this. I've been driving and riding in France for 40 years and can confirm that the average French driver is a nutter who disregards all speed limits and can't stand to have another vehicle in front of him/her. They overtake just about anywhere with what I assume to be x-ray vision to see around corners and over hill crests. Some years ago they started to errect 'dead men' statues at the side of roads. Black life-sized, some child-sized, effigies where there had been crashes - one for each fatality. On some N roads there were dozens of them in as many miles, sobering to us Brits but seemingly ignored by the French. Though pi$$ed off to have been 'caught' and fined I can truly understand why the French are taking such a hard line with speeding. Unlike the UK it's not just revenue collection it's an attempt to lessen the carnage on French roads. I don't think they can be bothered with foreigners. I picked up a ticket in Florence for inadvertently using a bus lane, and received a fine in the post back in the UK. The letter had all sorts of warnings that they can prosecute, etc., but I binned it, and never heard from them again. I got a speeding ticket in the post from Germany last year, I paid it, 10euro's for 69 in a 60. Those debt collectors could put 100e on it. Not worth chancing.